Gravitas is Talib Kweli’s sixth solo album, which was released this past December, a mere seven months after his last album, Prisoner of Consciousness. Well, if Kweli was trying to break free of the label “conscious rapper,” he failed miserably. Gravitas is true to form, drawing attention and awareness on political, social and women’s issues. Another label that Kweli probably wouldn’t like is lyrical. This album is full of lyrical raps, with less focus on the music. The beats are simply there to support the words, which are full of dignity and seriousness – the meaning of “gravitas.” Included among the fervent verses are Big K.R.I.T., Gary Clark Jr., Abby Dobson, Raekwon, OhNo, UnderAchievers, RES and Mike Posner. The album starts with “Inner Dialogue,” where Kweli addresses the source of most rappers’ wealth (clothing and liquor). He then exposes some of his own demons in “Demonology.” “State of Grace” tells the tale of a female rapper in a man’s world. Later on, Kweli delivers a heavy “Wormhole” attacking the current focus of who are and who aren’t Illuminati in the rap game. He concludes the album with “Colors of You,” a smooth love song and the only one on the album I found myself singing the next day. 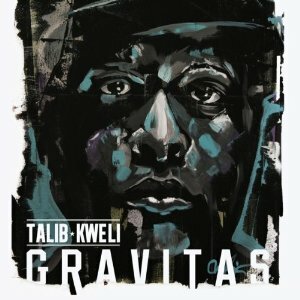 Overall, Gravitas sounds like every other Talib Kweli album I’ve ever heard, and that’s not a bad thing. Kweli knows who he is and what he wants to say. The only change is the distribution of the album. Gravitas is available through Kweli’s website, cutting the middleman out of the picture. Now that’s a conscious game changer.